Woman, an epitome of beauty, affection, patience and selfless nurturing; she is something more than what words can describe. When we imagine womanhood, our mind summons up at the picture of our mother, grandmothers, daughter, wife, and friends and it brings out the varied emotions of love, respect and admiration. Every year on March 8th, we celebrate International Women’s day as an opportunity to appreciate the vital contribution of women to our world. And admit it ladies, even we as a woman don’t give ourselves enough praise for all the efforts that we put in each day. Let’s change that. Let the enthusiasm from around the world -whether it involves eating cupcakes, donning red shades of lipsticks or protests or awards or gifts; inspire how you reflect yourself. 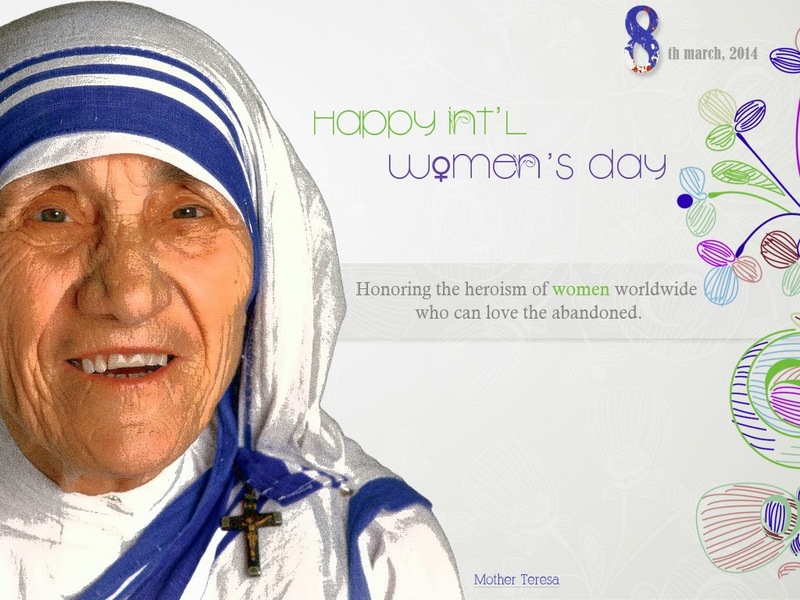 March 8th, 2014 marks the 103rd anniversary of International Women’s Day, and I make the most of this day to acknowledge the unwavering spirit of women worldwide. My small pat on the back to women, including me through something that symbolizes them; I present to you a different initiative dedicated to femininity. 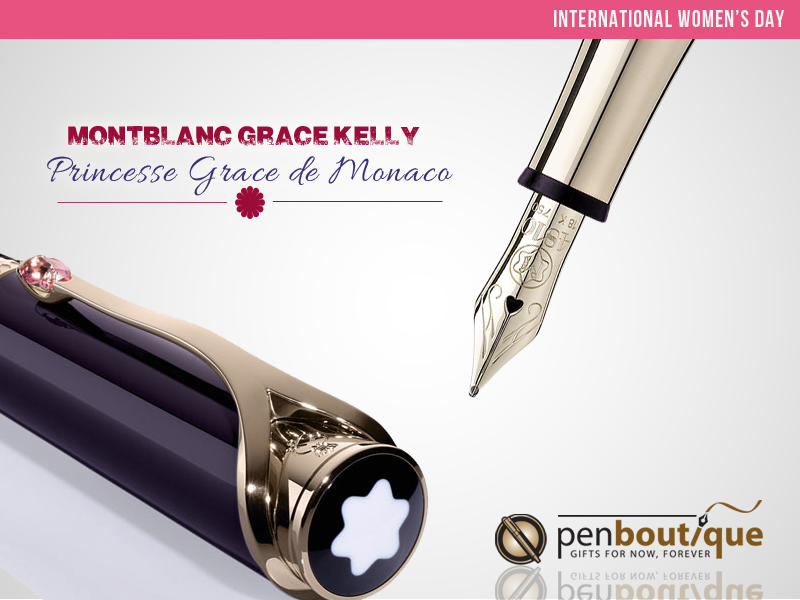 Let’s pay a tribute to an extraordinary woman and her impeccable glamor with PRINCESSE GRACE DE MONACO FOUNTAIN PEN. With a sensuously feminine neckline design, crafted from deep purple precious resin with champagne-tone gold-plating, it evolves into a majestic edition perfected with a lavish pink topaz on the clip. Be reminded, stones are simply a woman’s best friend. Both cap and barrel rings are intricately engraved with a rhombus pattern, inspired by the Principality of Monaco’s coat of arms. This edition underlies Montblanc’s commitment to step beyond functional beauty and acknowledge the inner charm of the woman in the walk of our lives. Now if you have always been pulled towards the bubbliest and vivacious side of a lady, then continue the perky celebration with a swing in pink. LAMY SAFARI PINK LIMITED EDITION is perfect as adoration to the young girls who I’m sure would like to have simply everything in their favorite color. 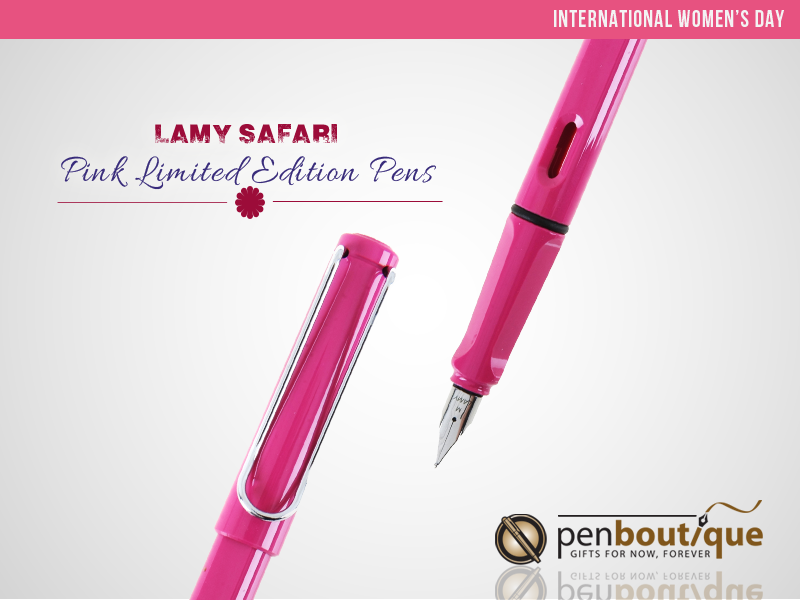 LAMY has chosen trendy pink for this special model of the safari making this Lamy safari pink one of the ‘must-haves’ for every young girl, keeping in mind that all the women are always young. Age is just a number and in our case, a secret one. The limited edition means it will be a sought-after collector’s item. The bright pink pen makes writing so much more fun – you might just get a neatly scribbled ‘Thank you’ note for choosing this as a gift for your princess. Last Women’s Day, I was simply flattered when a little neighbor of mine came to me with pretty yellow flowers. Though they were made of colored papers, nothing could have lured me more than his attempt to value a woman’s presence in this world. He supposedly learnt this in school and I learnt from him that it’s an Italian tradition to give mimosa flowers to women on International Women’s Day. Everyone is aware--Italy possesses the unmatched passion for beauty, style and glamour. 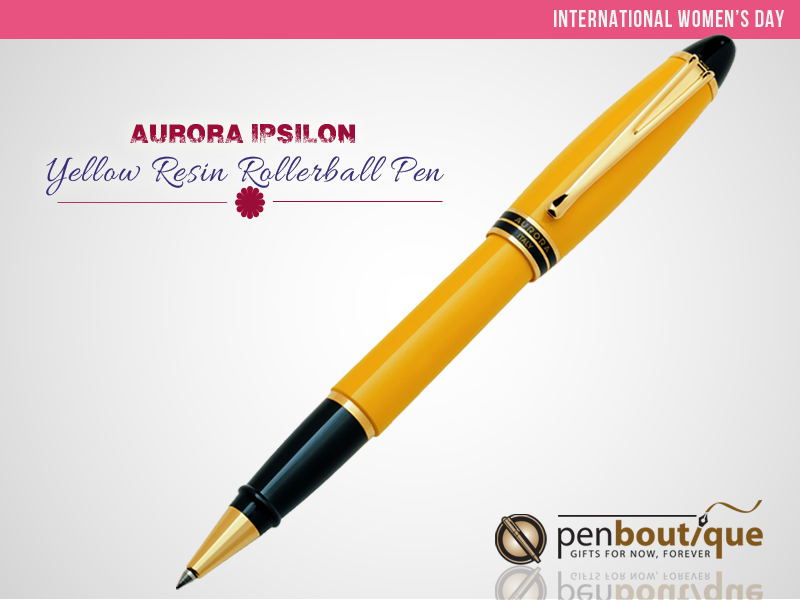 So, giving Italian celebration a modern touch, AURORA IPSILONYELLOW RESIN ROLLERBALL PEN is Aurora’s own modern little yellow Mimosa created as souvenir for your everyday friend and a faithful companion. This mission is carried out with striking success by the Ipsilon, the pen that is eye-catching because of its innovative design, full of personality and characterized by the persona of a vibrant woman. A bit of an international knowledge of facts and details is always smart. A new social initiative seeks to celebrate International Women’s Day using Red lipstick as the symbol of empowerment. Red, this bold color gushes femininity. Though beauty has no shade, it’s time you go around with the color of ‘Women Empowerment’ bright enough to make a long lasting impression. 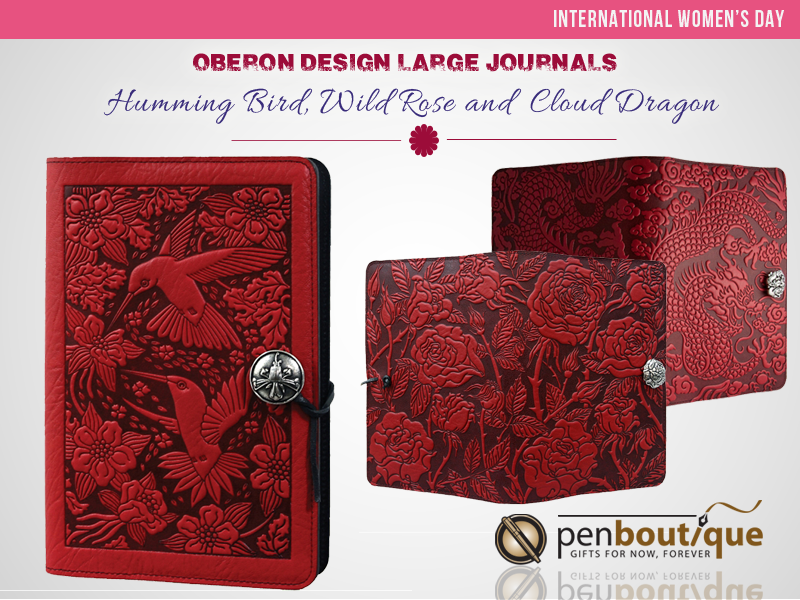 My International Women’s Day pick would be Oberon Design Hummingbird Large Journal in Red. Her untamed bloom can also be garnished with Oberon Design Wild Rose Large Journal or the Oberon Design Cloud Dragon Large Journal will equally complement the fiery ablaze side of hers. Each of these elegant Oberon diary is handmade. Features include 208 pages with lined template sheet to facilitate writing. They are accompanied by a book insert and a Matching Britannia Pewter button. All her wishes and dreams treasured underneath the sheath of red. Feels just right! Sometimes, a little means a lot. While it’s not possible for you to control the genes, there are powerful steps you can take to protect your loved ones and help other protect theirs. 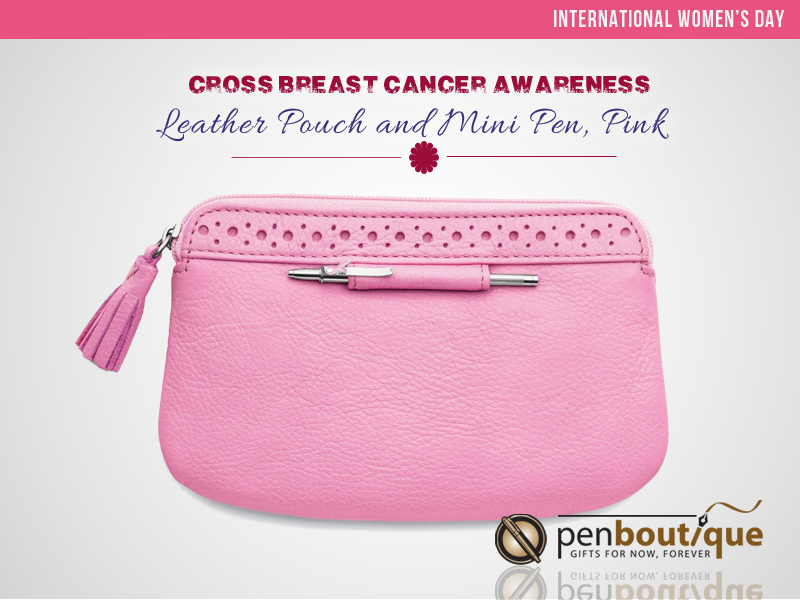 CROSS BREAST CANCER AWARENESS ACCESSORY POUCH is small, but can make a big difference in supporting the cause. Defeat Breast Cancer. Its features include a zipped-top with outside pocket, a pink ribbon-patterned poly satin lining and Cross mini pen in the company of pink enamel awareness ribbon. For every purchase, Cross will donate 10% of the retail sales to Susan G. Komen for the Cure®. Along with the women of your life, here’s a whole new way of thanking the women worldwide and paying them back for their unselfish acts of making this world a happier place to live. Although the status of women worldwide had leaped drastically till date since the early 1900s, now is the right time to acknowledge the great achievements that women have brought together with our everyday lives, and also have a glance at all the accomplishment that remains to be made with time. She can be you, your mom, your best friend, adoring sister, your wife or a female colleague; Make her smile this Women’s day!